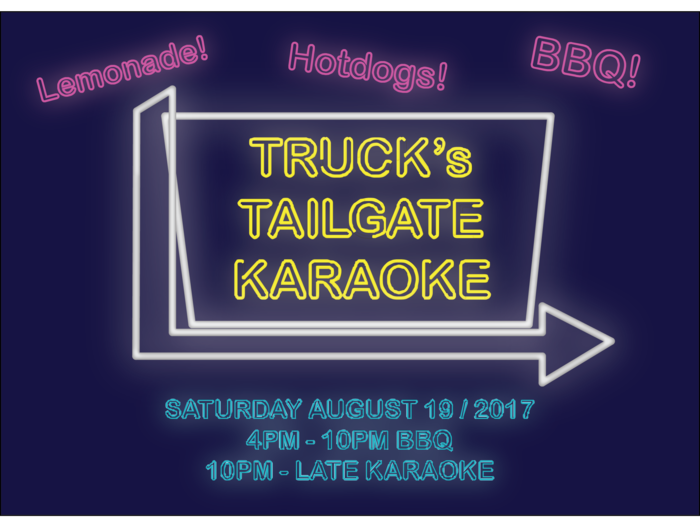 Join the TRUCK crew as we open up the Main Space to the summer sun on Saturday August 19 for our BBQ fundraiser. Starting at 4PM we’ll be grilling up hotdogs and serving a special batch of refreshing lemonade courtesy of Lowell Smith to help beat the heat. Once the sun sets, it’s time to fire up the microphones and search Youtube for all your karaoke desires. What better way to beat that summertime, su-su-summertime sadness than to share good eats and sing with friends! TRUCK is having a cake decorating competition fundraiser! "Not So Good Lookin’ Cake!" "Cake That Looks Most Like A Truck!" The many talents of host Seth Cardinal & house band Soft Cure will sweeten the deal! Competitors are welcome to bring their own supplies to decorate with! Truck would like to acknowledge the generous support and donation made by Bite Grocer & Eatery! Sarah Adams is a visual artist, comedian, mother, cake maker, community & arts advocate, and gal-about-town. She graduated the Alberta College of Art + Design in 2005 and has since spent her time doing many things associated with the previously mentioned pursuits. Hannah Doerksen is a visual-artist based in Calgary, AB. While she always intended to be based elsewhere, she has not yet discovered sufficient justification to begin confronting her hoarding tendencies in preparation for a more transient life. Her learned & inherited skills have gained her several professional successes here, but have rarely lead to any accumulation of money. Doerksen’s mother once bought a calendar which featured photos of outrageously decorated cakes. Doerksen looked often upon this calendar and now considers herself an authority on the art of (mis)communicating emotion via cakes. Because of her difficult-to-disregard physical presence and her relentless opinion thrusting, it is not un-heard of for her thoughts to be taken into consideration by her peers. Miruna Dragan is a post-conceptual artist and instructor at the Alberta College of Art + Design. Operating within and between various modes of studio research including drawing, lens-based media, site-specific intervention and others, her work interprets surreal geographies through the reanimation of archetypes, myths, and symbols. Dragan’s work has been exhibited in national and international venues, including Museo de la Ciudad in Queretaro, Mexico (2009, 2012), Khyber ICA in Halifax (2011), the Calgary Biennial (2012), the Esker Foundation (2013), the Southern Alberta Art Gallery (2017), and the Alberta Biennial (2013, 2017). Rita McKeough is an audio media installation and performance artist based in Calgary, Alberta. Her installation and performance work often includes multiple audio works and more recently, the incorporation of electronics and mechanical performing objects. McKeough has a concurrent interest in community radio and playing drums in various bands, and is currently in the band Sleepy Panther with friend Richard Brown. McKeough has been exhibiting throughout Canada since the late 1970s and is currently teaching at the Alberta College of Art + Design. She has been very fortunate to have the support and assistance of friends and community to produce her work. McKeough’s work has been featured in Radio Rethink: Essays on Art, Sound and Transmission (Banff Centre for the Arts, 1993) and Caught in the Act: Canadian Women in Performance (YYZ Books, 2004). Diana Sherlock is a Canadian independent curator, writer and educator whose projects create opportunities for contemporary artists to produce new work in response to specific collections, contexts, histories and cultures of display. A lesser known fact is that, in her former life, she decorated cakes for a living and to put herself through university. Now, for one night only at TRUCK's Fundraiser, FOR GOODNESS CAKES, these two worlds collide and sprinkles, glitter and sweetness will reign. TRUCK Contemporary Art in Calgary is dedicated to creating safe and inclusive spaces for participating in contemporary art. The TRUCK Main Space is located on the main floor of the building (2009 10 Avenue SW). Our washroom is gender neutral and wheelchair accessible. TRUCK will invite teams to scour the downtown core in search of the perfect photo as prescribed by a special Challenge List. Participant’s photos will be displayed at the gallery for the After Party where guests will be asked to vote for their favorite photos. There will be prizes awarded to the top voted teams as well as exciting raffle prizes!